The Championship bracket play opened today and by the end of the night we will know who will be playing in the Elite 8. Here’s Part 1 of the top performers we saw today. Tyler Brelsford Guard (ETU Select)- They say point guards are judged by wins and Brelsford has guided his boys into the Sweet 16. The savvy floor general picked up his play in the second half against regional rival DC Assault. He used his penetration style to drive, draw and dish the rock to waiting finishers. He finished the game with 13 points and 7 dimes. He has been impressive in each outing I watched. Terrance Williams Forward (ETU Select)- Williams played his best game today from my eyes. He established position inside and rolled to the basket as Brelsford penetrated. He showed good hands and touch after receiving the rock. He needs to play with this same energy if they expect to advance. 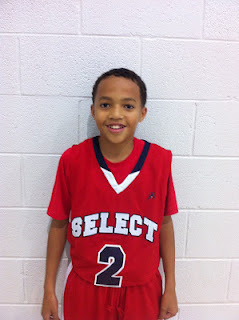 Tyrese Jenkins Forward (ETU Select)- ETU’s other forward played good on the weak side. He crashed the glass while collecting 11 rebounds while also getting involved with the scoring (10 points). His size and play will also be a factor later in the tournament. Dajuan Piper Guard (Metro Flyers)- The Flyers struggled to score until Piper picked things up in the second half. He used his good body control to draw contact and still finish. He rallied off some quick buckets that helped the Metro boys take home the victory. In the future I would love for him to add a pull up jumper to his arsenal. Daniel Rodriquez Forward (Metro Flyers)- After struggling to finish early the big fella came up big in the end. He kept the rock alive on the offensive boards and had a key put back to help them preserve the victory. Mikeal Jones Forward (Team Nelson)- Jones saved his best play for the 4th quarter in their dog fight versus Team IZOD. He commanded the rock on the baseline and contributed once he touched the pill. His agility separates him from most of his peers. He delivered when they needed him most. Mark Bradshaw Guard (Team Nelson)- After having a tough day from the perimeter Bradshaw hit one of the biggest shots in his young career. With time expiring in regulation he nailed a trey ball at the buzzer to give them the 3 point victory over rival Team IZOD. It’s the shot of the tourney thus far. John McGriff Guard (DC Assault)- DCA gave ETU all they could handle most of the game and McGriff was one of the main reasons. The flashy southpaw point guard was impossible to keep out of the lane. Once he got in he used his floater and court vision to make a difference. It seems like DCA has another top pg on the way. Mike Sumner Guard (DC Assault)- Sumner looked good playing alongside McGriff. He’s a combo now but probably will move over to the point in the future. He already has the toughness DCA guards are known for. Marc Bruce Forward (Team IZOD)- Bruce steady play helped IZOD keep things close. He hit a few outside shots and converted in the paint. He needs to get a little quicker off the bounce but I love his basketball IQ. Jay Lagroon Forward (Upstate Warriors)- At first glance I thought Lagroon was a post player but once he handled the rock his versatility stood out. He made things very difficult for the Metro Flyers forwards to keep up with him. He’s a name to know from South Carolina. Quinton Johnson Guard (Upstate Warriors)- The gutsy guard is the heart and soul of this squad. He handles the point but will also take a deep three if left open. He plays with the heart of a lion and his energy rubs off on his teammates.